So now that you are probably way over the 2016 trend of bottle flipping, are you ready for the HOT TOY TREND for 2017?! Yes, you heard that right. 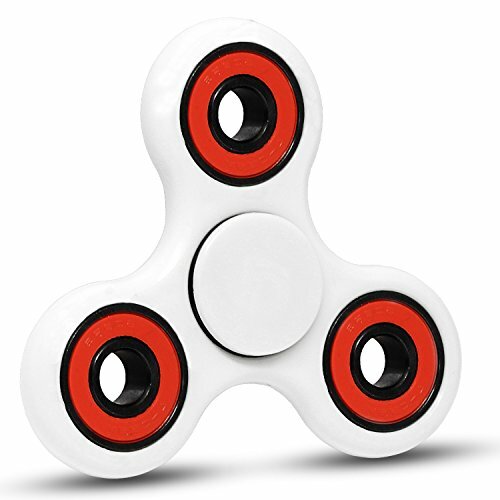 For those that don’t know (and I just learned myself this past weekend), a fidget spinner is actually not a gourmet drink, but a small 3 inch toy made of plastic or metal that can be spun around on your finger or on a flat surface. Most seem to have three smaller circled prongs, but some have only two prongs. Pretty much that is what they do – spin! Pretty simple but some claim that these gadgets help with ADD, ADHD, autism, stress relief and general focus. The fidget spinners come in any variety of colors, materials, and the cost can range wildly from a couple dollars to a couple hundred dollars. If you search on Amazon.com, you will find thousands. Let me tell you how I learned about these toys. My twins demanded that we stop at 7-11 (the convenience store) on the way home from shopping. I assumed that when they said they needed a ‘fidget spinner’ they really meant a ‘Slurpee’ drink. I soon was informed (after getting the Slurpees anyway) that the fidget spinner was a toy, that according to my kids, could only be found at 7-11. My intrigue began to grow as I called probably fifteen more 7-11 stores in the area and all were sold out! OK now I HAD to have this toy. My kids convinced me to find them online (and thus I landed of course on Amazon.com) and have them delivered the next day so they could break them in before the weekend was over. Below are the two brands I chose from the thousands of available items. These seemed like a good choice based on the durable materials used and the under $20 price. The OZO9 fidget spinner spun for 2 minutes 45 seconds while the one by Q Comfort spun for 2 minutes 5 seconds. This may be important to your kids if they need to win the fidget spinning contest. Needless to say the fidget spinners arrived the next day as promised and my kids loved them. Both kids brought the fidget spinners to school and I made sure they knew not to lose them. Of course my son’s teacher took his fidget spinner away on the first day! Yep! So it has been a couple weeks now with our new fidget spinners. The craze is still going. My kids now have demanded fancier spinners. I succumbed to the pressure from my kids and bought a couple more gadgets online. I bought some spinners that were described as glow in the dark. One glows and the other does not. The defective (or mislabeled) spinner is going to be returned since it cost a bit more than the basic spinners. I bought two more just because my kids liked the colors (blue, grey, light green). These seemed to be good quality so I added them to the Counting Candles store. Finally as a special surprise, I stumbled upon inexpensive plastic light-up fidget spinners in a small postal delivery store. These were clearly not made of the metal and heavier material as the others but the goal wasn’t to spin the longest so I didn’t care. My kids loved these light up spinners. Lastly, today was the day that my kids have been dreading! Yes, the school principal announced on the loud speakers that fidget spinners are no longer permitted at the school. They are now BANNED!